Pearl Ex Powdered Pigments - the original art mica powder. 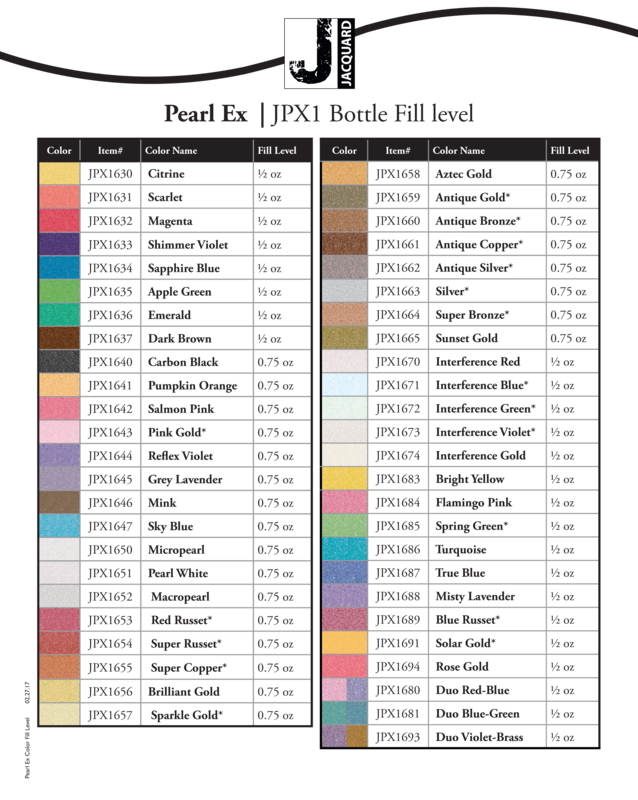 Pearl Ex pigments are dry, with a neutral pH, so they last for years and only small amounts are needed for most products. Pearl Ex can be added to pretty much all types of resin, epoxy, polyurethane, and UV resin, as well as mixed with almost any colour of craft, acrylic or watercolour paint, to create a metallic sheen. Pearl Ex pigments are colourfast, temperature resistant, weather resistant and non-tarnishing, therefore ideal for archival applications. PearlEx creates a metallic look without being a metal - it will not tarnish or fade. The different particle sizes produce different looks, from a smooth pearly lustre, to a highly metallic sheen. Use on resin, fabric, paper, shrink plastic, polymer clay, leather, melted wax, clay, gouache, glass, wood and encaustics - I'm sure you can come up with other exciting mediums we haven't even thought of! Note: Pearl Ex Powdered Pigments were specifically developed as an art material. They are NOT for cosmetic use. PearlEx pigments are sold by weight not by volume. Each pigment within the range of PearlEx is a different density which means that one particle of a particular colour can weigh more or less than a particle of another colour. This will mean that the pots may appear to the eye to have widely different volumes, but the weight will be the same. Create your own unique colours by kneading Pearl Ex into polymer clay. Bake clay following manufacturer's instructions. Allow to cool before handling. Pearl Ex is embedded in the clay so there is no need to varhish unless you want a glossier surface. For large areas of colour use your fingers, a Q-tip or a brush. For more control use a small brush. Work Pearl Ex into the surface and brush off excess. Bake according to manufacturer's instructions. Brush or spray varhish on surface when cool to seal. Dust a polymer clay rubber mould with Pearl Ex before pressing in the clay. This is a great way to colour the clay. It also makes the clay easier to release from the mould. Simply dust the mould with Pearl Ex using a soft bristle brush. Turn the mould over and gently tap out excess. Press conditioned clay in to the mould and get instant beautiful colour! Bake polymer clay following manufacturer's instructions. Allow to cool then coat with varhish to seal. To make a Painted Image Transfer, simply mix Pearl Ex with water, paint a design on paper and lay a sheet of polymer clay on top. Gently press down with a rolling pin, carefully pull away the paper, trim clay and bake. Seal with varhish when cool if desired. Dust Pearl Ex Powders onto shrink plastic before shrinking. The powder will become embedded in the surface when the plastic shrinks. When cool wipe off excess for a soft glow of colour. Coat with varnish for a glossy finish. To create a more intense colour, sand the shrink plastic before dusting on Pearl Ex. Mix Pearl Ex with any clear medium to use over any surface. Example: use a plastic dropper to add varhish to Pearl Ex. Mix to desired consistency and paint on wood, metal, plastic or baked polymer clay. Dust Pearl Ex onto any surface and then seal with a spray lacquer. Spray the lacquer out over the surface and let the mist fall onto the surface rather than spraying the lacquer at the surface. This will give you a more even coat of lacquer without spray marks as well as preventing the spray from blowing off the Pearl Ex. ****We also have Pearl Ex Varnish 2.25 fl oz/70 ml, which is a water-based varnish that can be used as a medium or top coat with Pearl Ex Powdered Pigments. Works great on paper, clay, metal, wood or plastic and cleans up easily with water. This varnish enables Pearl Ex users to create their own lustrous metallic paints, glazes and durable finishes on every surface.